A stylish 3 dial panel interior provides the centrepiece for the interior cabin with a multifunctional display that controls all your entertainment. 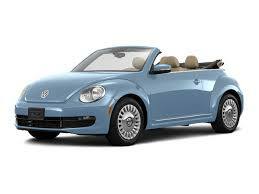 The exterior displays the classic Beetle look with the unique soft top look, all finished off neatly with a subtle rear spoiler. All these combine to offer head turning looks and charm. Seating 4 you can take the family off for the day not just yourself and 1 other person and with a boot that can carry up to 225 litres of luggage, enough for the weekend. The engine options are highly economical with automatic and manual versions available and engine sizes ranging from 1.2 litres to the 2 litre Cabriolet Sport version. In total there are 4 versions to choose from with something for every taste and every pocket. Optional extras include keyless entry, dash pad, decal stripes, chrome finishing, alarm and even a wind deflector amongst many other items to choose from.